This business centre is built on a modular design to allow flexibility for tenants to annex additional space as their business grows. The centre is fully modernised with a high-tech security system and easy disabled access including a lift. A fully staffed reception is provided and also available are waiting facilities and a boardroom for up to eight delegates, with onsite catering for your meetings. Located in Hyde, there are a variety of local amenities and major transport links. This business centre offers a number of competitively priced modern office suites in a range of sizes. 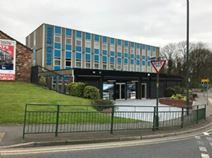 Car parking is plentiful, and the site is just a short drive from the centre of Stockport, and a short walk to the centre of Hyde. Easily accessible from the Motorway network.